Gallo-Teck is an independently owned and operated electrical contracting company which has over twenty years experience in battery-based systems, including solar power. Whether you want to buy a solar power unit or have it professionally installed, our licensed and fully insured technicians have got you covered. Solar power is a green, renewable form of energy that produces no harmful emissions yet can fully power your home. 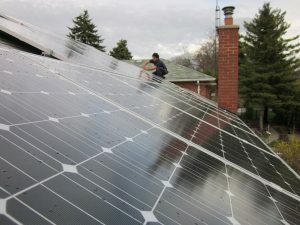 Going solar means you can say goodbye to your monthly hydro bill and increase the value of your property—not to mention with all the advancements in solar technology over the years, prices on solar panels have never been lower. Gallo-Teck crafts custom solutions based on the needs and desired outcome of a customer. We regularly install and maintain “off-grid” solar power systems. This type of system allows our customers to produce and store their own power. When the power runs out, users can then rely on an automatic backup generator. The other common type of solar power system we install is the “grid-tied” system. These systems are connected with your electrical utility company's “grid” which acts as your backup generator. When implemented, you may enter into a net metering agreement. Through this agreement, any extra power you feed back to the grid through your solar power system is then credited back to you on your electrical bill. In some instances, a utility company may even pay you more for your excess power. Gallo-Teck offers off-the-shelf products as well as full start-to-finish installations, repairs, and solar electrical inspections/consultations. With solar power systems, you get what you pay for, and that's why we are proud to offer a variety of premium products including ROLLS and “Discover” brand batteries and Xantrex XW inverters. 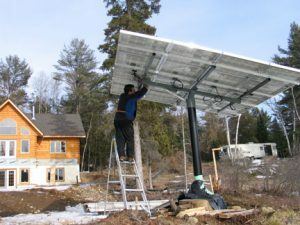 We provide solar products and/or installations anywhere within a two-hour radius of Bancroft, Ontario, though we will make exceptions depending on the nature of the project and work required. For more information about our solar power solutions and how they can benefit you, contact us today.